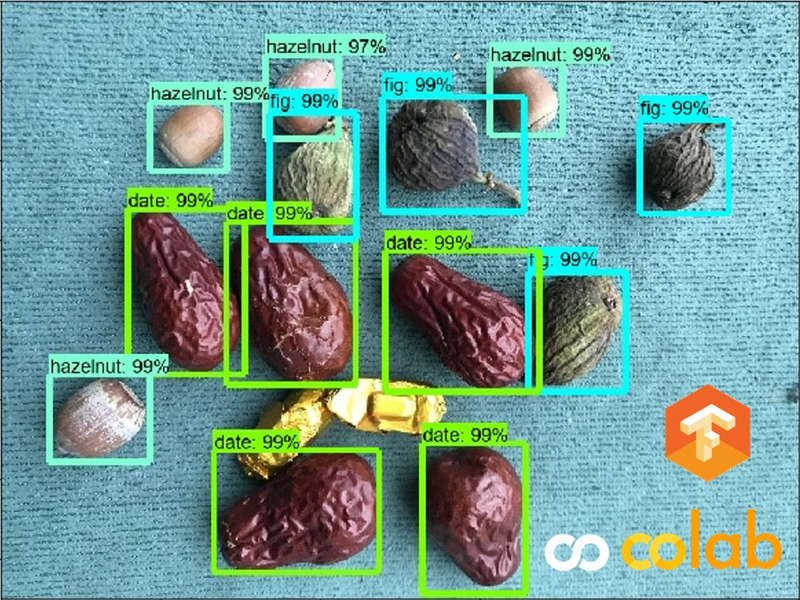 In this tutorial, you will learn how to train a custom object detection model easily with TensorFlow object detection API and Google Colab’s free GPU. Annotated images and source code to complete this tutorial are included. TL: DR; Open the Colab notebook and start exploring. Otherwise, let’s start with creating the annotated datasets. During this step, you will find/take pictures and annotate objects’ bounding boxes. It is only necessary if you want to use your images instead of ones comes with my repository. If your objects are simple ones like nuts and fruits in my example, 20 images can be enough with each image containing multiple objects. In my case, I use my iPhone to take those photos, each come with 4032 x 3024 resolution, it will overwhelm the model if we use that as direct input to the model. Instead, resize those photos to uniformed size (800, 600) can make training and inference faster. You can use the resize_images.py script in the repository to resize your images. python resize_images.py --raw-dir ./data/raw --save-dir ./data/images --ext jpg --target-size "(800, 600)"
Next, we split those files into two directories, ./data/images/train and ./data/images/test. 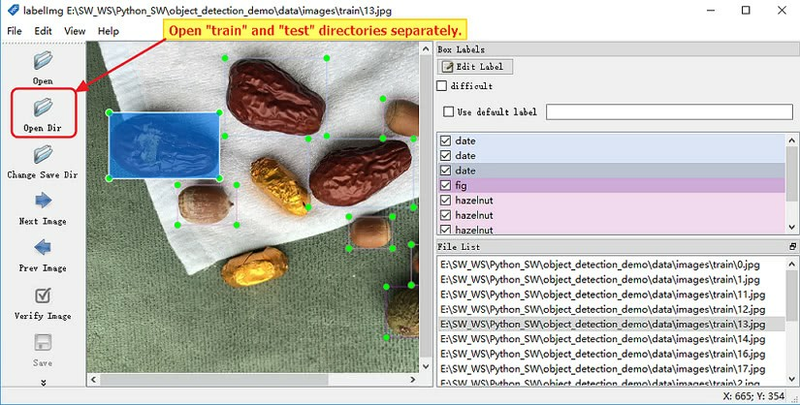 The model will only use images in the “train” directory for training and images in “test” directory serve as additional data to evaluate the performance of the model. Annotate resized images with labelImg, this annotation tool supports both Windows and Linux, it will generate xml files inside ./data/images/train and ./data/images/test directories. Tips: use shortcuts (w: draw box, d: next file, a: previous file, etc.) to accelerate the annotation. After running this step, you will have two files train.record and test.record, both are binary files with each one containing the encoded jpg and bounding box annotation information for the corresponding train/test set. The tfrecord file format is easier to use and faster to load during the training phase compared to storing each image and annotation separately. Converting the individual *.xml files to a unified *.csv file for each set(train/test). Converting the annotation *.csv and image files of each set(train/test) to *.record files (TFRecord format). Use the following scripts to generate the tfrecord files as well as the label_map.pbtxt file which maps every object class name to an integer. 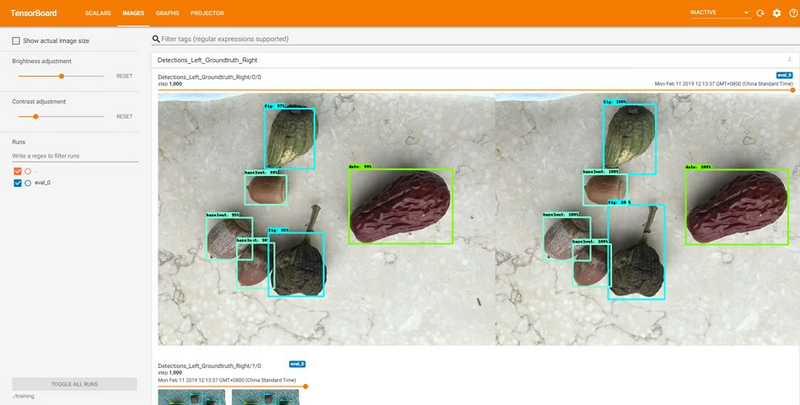 Instead of training the model from scratch, we will do transfer learning from a model pre-trained to detect everyday objects. Transfer learning requires less training data compared to training from scratch. But keep in mind transfer learning technique supposes your training data is somewhat similar to the ones used to train the base model. 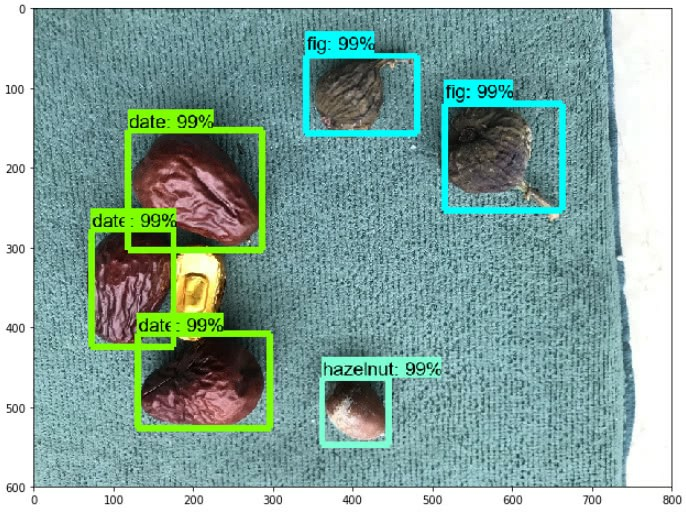 In our case, the base model is trained with coco dataset of common objects, the 3 target objects we want to train the model to detect are fruits and nuts, i.e. “date”, “fig” an “hazelnut”. They are similar to ones in coco datasets. On the other hand, if your target objects are lung nodules in CT images, transfer learning might not work so well since they are entirely different compared to coco dataset common objects, in that case, you probably need much more annotations and train the model from scratch. To do the transfer learning training, we first will download the pre-trained model weights/checkpoints and then config the corresponding pipeline config file to tell the trainer about the following information. After that, we can start the training, where the model_dir is the path of a new directory to store our output model. Inside the colab notebook, TensorBoard is also configured to help you visualize the training progress and results. 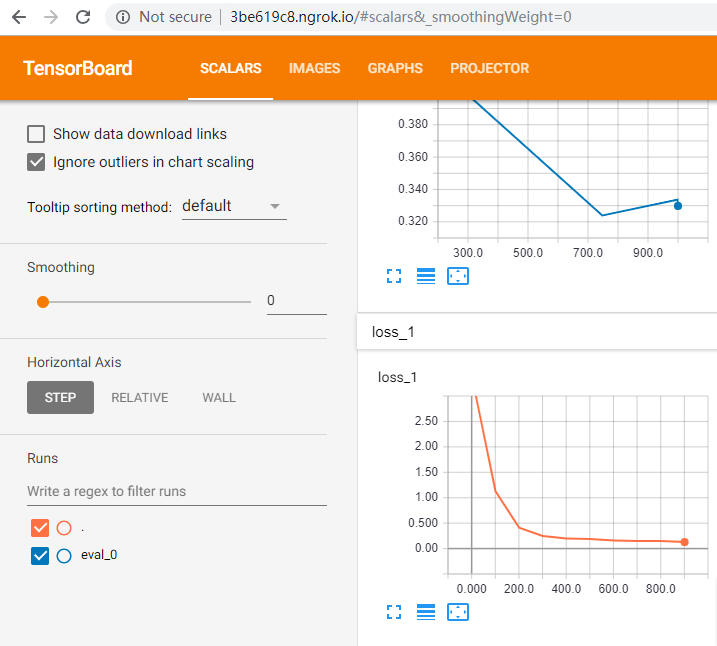 Here are two screenshots of TensorBoard show the prediction on test images and monitor of loss value. You can find the model frozen graph file at path fine_tuned_model/frozen_inference_graph.pb. Download it either through Google Drive or directly as shown in the colab notebook. The final section in the notebook shows you how to load the .pb file, the label_map.pbtxt file and make predictions on some test images. Here is a detection output example. Intel CPU/GPU accelerated with OpenVINO tool kit, with FP32 and FP16 quantized model. Movidius neural compute stick with OpenVINO tool kit. Nvidia GPU with Cuda Toolkit. SoCs with NPU like Rockchip RK3399Pro. Stay tuned and don’t forget to check out the GitHub repository and the Google Colab Notebook for this tutorial.